FREE ISSUE OF THE KICKOFF! 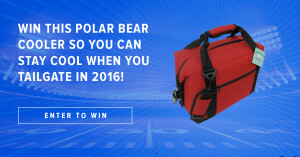 The Polar Bear Cooler (retail value $59.95) will hold up to 12 cans and 1 bag of ice, yet it is portable enough to keep in your truck or car. We’ll do a random drawing April 1st so make sure you’re in the running. The Kickoff provides two types of subscriptions — a weekly subscription for individuals and a sponsorship program/subscription for businesses. I'd like to be in-the-know on the latest, most in-depth college football info. I want my top customers to receive 17 issues of The Kickoff, prominently featuring my company's logo. Subscribe to our free monthly newsletter for giveaways, blog updates and more.